We ate delicious local dishes last evening. It is the yakiniku which we eat tonight. 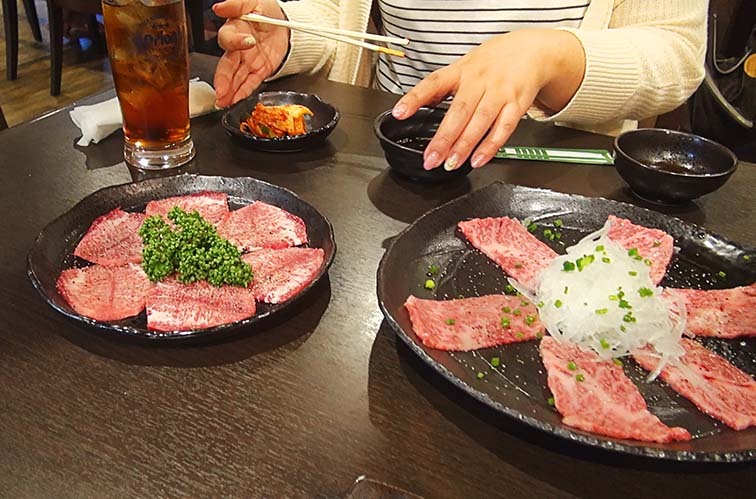 Some delicious beef is in Japan. Kobe, Matsusaka, Yonezawa, Tajima, and Omi and so on. Ishigaki beef is high-class like there. I rarely eat premium beef. 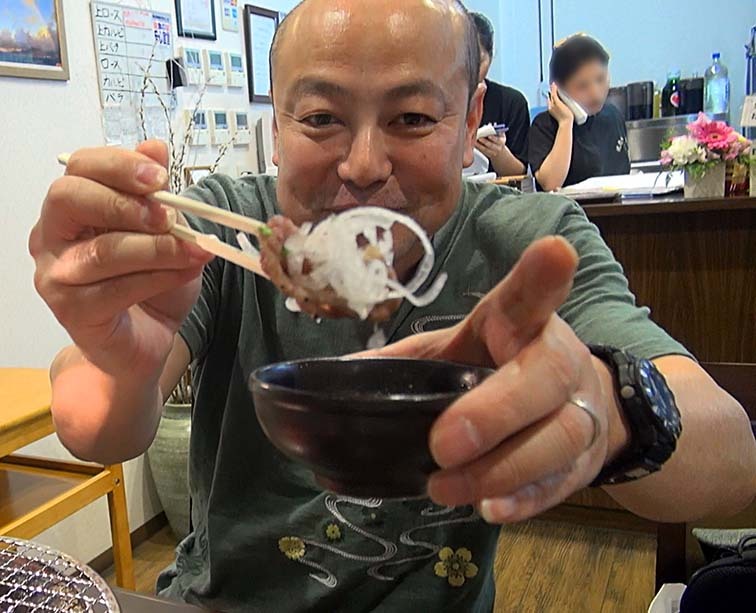 The Ishigaki beef is popular. 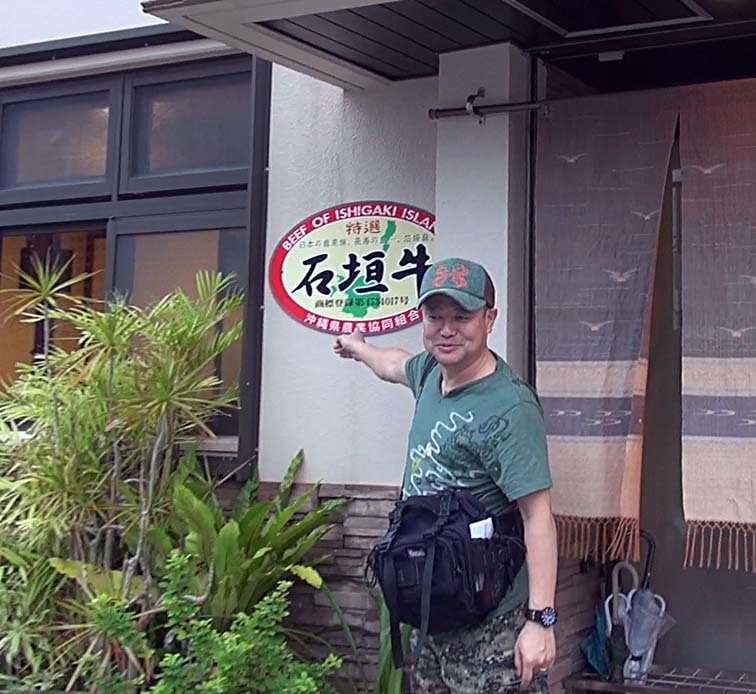 This is most popular Yakiniku restaurant in the Ishigaki Island. I go by the taxi. 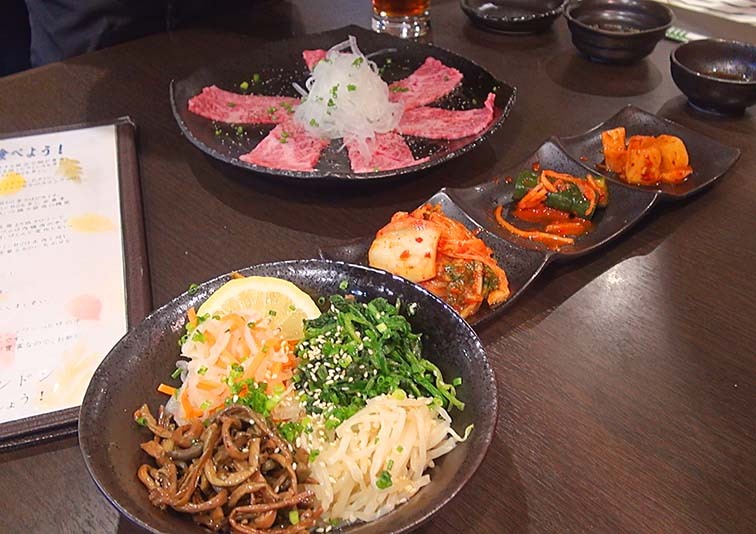 The yakiniku restaurant located at quiet street. There is signboard at the entrance. Is not "Migi gaki gyu". Since this restaurant is very popular. Appearance and an inside are clean. I asked the staff recommendation. 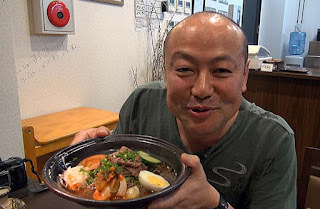 He say "Yaki syabu" and "Nikotan". So this is yakiniku restaurant. I placed an order for "Yaki syabu". "Sio tongue" and "Yaki syabu"
The meat sliced thinly is roasted lightly and eaten together with an onion. Oh, I see,this is Ishigaki beef. 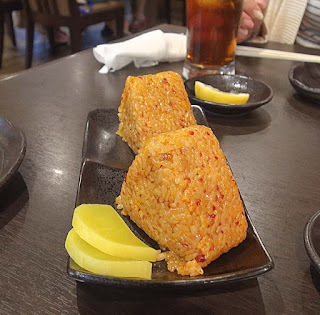 Although it is delicious, it cannot be satisfied yet. 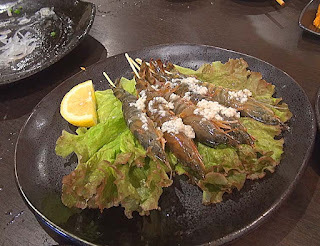 I always eat this one in Yakiniku restaurant. But not at that stage. I have expectations to Ishigaki beef. Those distinction became impossible to me. I take care so that it may not be grilled too much. 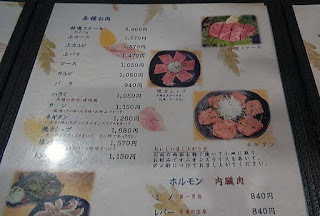 I ate three kinds of beef. All the beef are very delicious. It can bite by small power. Three kinds differ in the quantity of fat. The taste of fat and the taste of beef are good. Seasoning of meat is good. And the taste of sauce is good. Can eat such delicious beef at any time. Ishigaki island's people is lucky. I also eat Internal organs. Perhaps this is miso sauce. I cannot bite it off. The timing to swallow it is difficult. I can bite off easily. It seems to be konjak. The staff was carrying it to another table. I have to place an order. A taste like bibimbap . 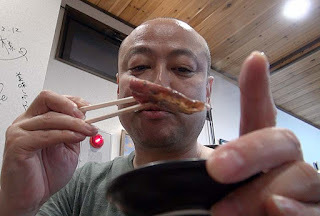 I usually eat only beef at Yakiniku restaurant. For me to place an order for this is that it is rare. Ishigaki Island is known for culture of a prawn. 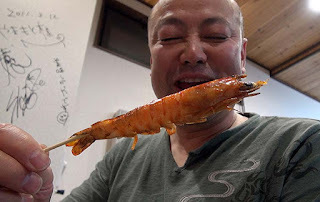 I can eat the head. It will become hard if it grill deeply. Sweetness different from a northern shrimp. It was good to place an order. 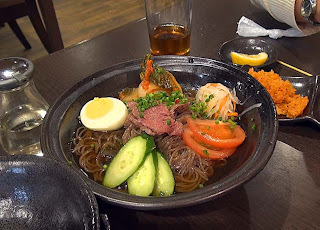 The Naengmyeon at the last. So My stomach was full, I was thinking whether to order. I thought that I would like to eat it. Soup of sour little taste refreshing.